I’ve already used bits and pieces of Santorini in one book (The Keepers’ Daughter), but having stayed for a few days this time, there are lots of aspects of the island I can’t wait to make use of in the future. The landscape is fantastic – cliffs, smoking volcano, black volcanic sand, sea the colour of orange juice and the temperature of a bath – and history oozes out of the place. 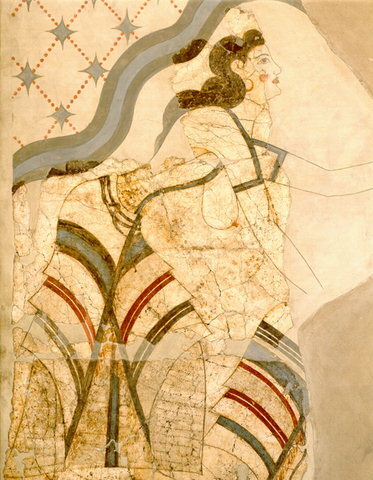 Archaelogists are currently excavating a site at Akrotiri that must be Greece’s answer to Pompei, judging from the quality of the wall paintings that are on display. It’s the life that the paintings show that’s so fascinating. You can identify the species of fish the fishermen are carrying, the lilies and swallows in some of the frescos, the detail of women’s dresses. There are monkeys and mallards and bulls and butterflies. One painting shows a flotilla of boats, with the rigging decorated with birds and butterflies and beads. How sophisticated would a civilisation have to be to bother with that? Welcome home! Now blog more photos – Santorini, Akrotiri – they sound amazing!